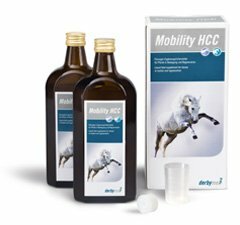 Mobility HCC is a liquid feed supplement containing the "HC-Complex" (25.000mg/L) - a combination of highly concentrated hyaloronic acid and chondroitin. The unique preperation ensures that the hyaloronic acid restores its original biological structure after being absorbed from the gastrointestinal tract. The administration of Mobility HCC can lead to an improvement in cartilage function and even to a complete regeneration of the cartilage. Hyaluronic acid is the essential base of the synovial fluid and responsible for the viscous consistencey. Synovial fluid serves as a puffer and as a source of nutrition for the cartilage cells which must be regulary formed. The cartilage is dependent on constant lubrication of hyaluronic acid in order to regenerate and to avoid dehydration. The production of hyaluronic acid is reduced by ageing which causes the cartilage to dry and become brittle. Chondroitin is an important cartilage component. It binds large amounts of water in connective tissue thereby giving the cartilage its elastic and shock-absorbing characteristics. The water binding is created through an electric charge, through which a gelatinous mass is formed in which the cartilage cells are embedded. This elastic basic cartilage substance not only contains chondroit sulphate but also a high percentage of hyaluronic acid. Chondroit sulphate is absorbed by the nutrition and partly by glucosamine sulphate produced by the body. A big problem with the regeneration of cartilage is transporting the nutrient resources, for the basic cartilage substance, to the cartilage cells. As the cartilage tissue does not contain blood vessels, it does not receive nutrition through the blood circulation but from the synovial fluid which also helps to remove waste from the cartilage metabolism. Chondroitin sulphate ensures that the cartilage tissue is permeable for the nutrition needed by the cartilage cells. Hyaluronic acid and chondroitin can deploy very well the cartilage protection in particular when they are administered together because they complement each other in their protective effect. The Administration of hyaluronic-chondroitine can lead to an improvement of the cartilage function and even to a complete regeneration of the cartilage itself. An application period of at least 30 days is recommended for an optimal care. The dosage varies depending on the purpose of application.